March is National Nutrition month and it’s a great way for us to bring awareness to how the type of food and the amount of it a person eats, directly affects their body. I’m sure you’ve heard the old saying — “You are what you eat”, well, that’s true! At StickyJ, we, fortunately, have many employees who are health conscious that set a great example and take special care to promote wellness in themselves and in others by eating foods which are not processed, which are chocked-full of necessary vitamins and minerals, plus they are proportionately accurate for their body type. The vast majority of medical conditions are a result of poor diet and exercise. An increase in food allergies and Diabetes have a direct correlation with the foods we eat. The amount of sugar and toxic substances consumed cause an increase in allergies, diabetes and ultimately cause obesity which can lead to the necessity for bariatric surgery. When we talk about good nutrition, we talk about making sure the organs in the body are fed properly with specific nutrients to ensure their balance. Nutrition is necessary for all parts of a being’s life cycle as balanced nutrition is necessary for optimal health and growth of cells. To help our many customers who have developed or were born with allergies to specific foods, we carry a product line with a variety of engravable plaques and silicone attachable bracelets to uniquely personalize and identify which foods they are allergic to. Some of the most common food allergies are Peanut, Dairy, Eggs, and Fish. Be sure to shop our children’s food allergy product line which is colorful and comfortable while providing optimal safety. For persons who have been diagnosed with Diabetes, it’s of the utmost importance to maintain a balanced diet with the proper sugars derived from natural fruits and milk such as coconut milk. Diabetics should limit their intake of unhealthy sugars which are often derived from processed desserts and sodas. At StickyJ, we carry a varied line of diabetic medical alert bracelets and diabetic necklace pendants too which are helpful for safety, yet remain fashionably stylish. Engage in your health and the health of your loved ones this year by paying homage to National Nutrition month. Be sure to keep your wellness in check by eating a properly balanced diet and exercising regularly. 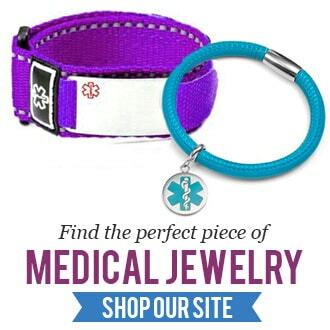 For safety and peace of mind, purchase medical alert jewelry for a style and safety uniquely personalized for you.